Today I journeyed with my brother and his girlfriend to the mystical food universe that is Wing Yip Superstore. With shelves and freezers filled with the largest array of authentic Eastern Asian products I've seen in London, Wing Yip is the place to visit when you're cooking something a little exotic and Sainsbury's just won't cut the mustard. The fridges and freezers at this place are brimming with pretty much every dumpling you can think of, from the much loved Char Siu roast pork buns through to Japanese Daifuku - sweet gelatinous rice cakes with a sweet filling. If you're a great advocate of animal rights, be sure to avoid the fresh seafood counter - among the vibrant red slabs of sashimi grade tuna are fish, crabs and eels swimming around in tanks hoping to be liberated rather than eaten. Not a nice sight. Moving on, this place offers aisles upon aisles of noodles, drinks, spices, rices, and sauces and sells kilo bags of herbs and dried birds eye chillies for just over a pound. I picked up a few exotic treats and a bamboo steamer with the total tallying up to just over £20. Here are a few of the items I hoarded while I was there. I think I'm worse with impulse buying food than I am with anything else. 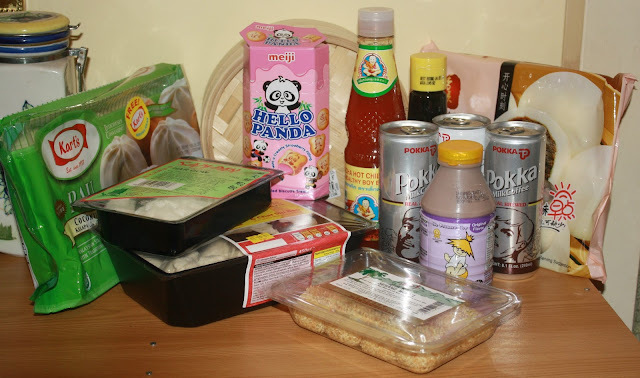 Are you a lover of Asian Supermarkets? Got any recommendations for me? If you're keen to visit Wing Yip, you can find Superstores in Birmingham, Manchester and Croydon. Live in London like me? Visit the Cricklewood store at 395 Edgware Rd, NW2 6LN. We go to one near Hanger Lane. Love all the unusual bits and bobs!